Here we are, just three weeks until Summerfolk. I am very excited about our 35th anniversary Festival and know there will be many musical highlights at concerts and workshops over the weekend. In previous blogs, I have featured maybe half the performer lineup and yet there are many more, each deserving of an article on their own accomplishments. But time is running out, so this week, I'll give you a brief look at the additional 2010 Summerfolk performers. Delhi 2 Dublin has created a buzz at folk festivals, last summer and this one, all across Canada. For example, this response came in from Rick Newbury of the Atlin Arts and Music Festival in northern British Columbia when I asked about the band's performance there last year: "D2D was a huge hit here and I recommend them highly. Seamless fusion of genres, traditional & new. What amazing energy and audience engagement. They will steal the show from other stages". The five members of Vancouver-based Delhi 2 Dublin come from different backgrounds and different musical influences. Their music is an exciting melting pot that blends the traditional sounds of North India with those of Ireland. Incorporating tabla, dhol, fiddle and sitar to progressive dance rhythms and cutting edge DJ aesthetics, Delhi 2 Dublin creates a multi-cultural celebration. Danny Brooks is well known in blues music circles. One of the most soulful singers on the circuit, Danny's strength is in his simplicity and sincerity. An excellent rhythm guitarist and harmonica player, his powerful voice compels every member of the audience to believe that he is singing to him or her alone. At the teepee, the centerpiece of Summerfolk's First Nations Village, hosts Kathryn Edgecombe and John Somosi will offer workshops on Aboriginal cultural traditions. 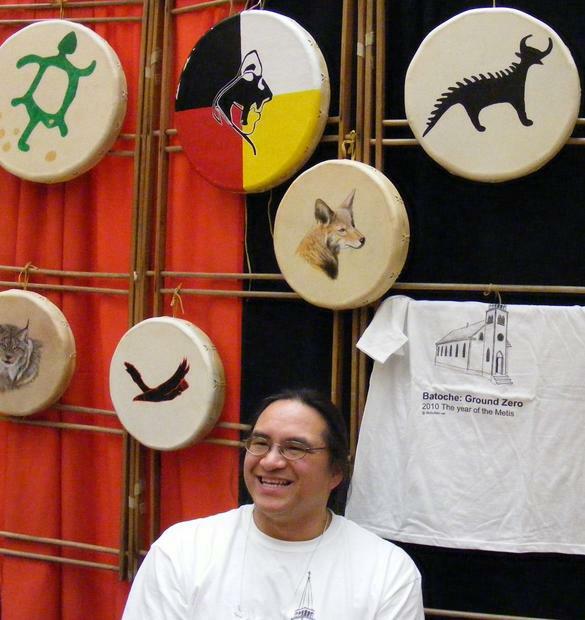 John is also a drum maker who readily shares his enthusiasm for drumming and singing. They will be joined by special guest Virginia Barter who is a Métis/Cree historical writer, musician, storyteller and filmmaker. Inspired by her family’s experiences in the Canadian north, Virginia weaves fascinating tales of fur trade history. The music of Caracol is filled with emotion. This quartet is fronted by singer Carole Facal, one of Quebec's best-known young performers and whose former band, DobaCaracol, was hugely popular in that province. She transcends the language barrier for those not fluent in French with her charismatic and charming delivery. With a supporting cast of superb musicians, her music draws from American folk and Jamaican rock-steady mixed into an interesting vintage '50s style approach..
Darlene is a performer who defies description. However once you've seen her perform, you won't forget her. 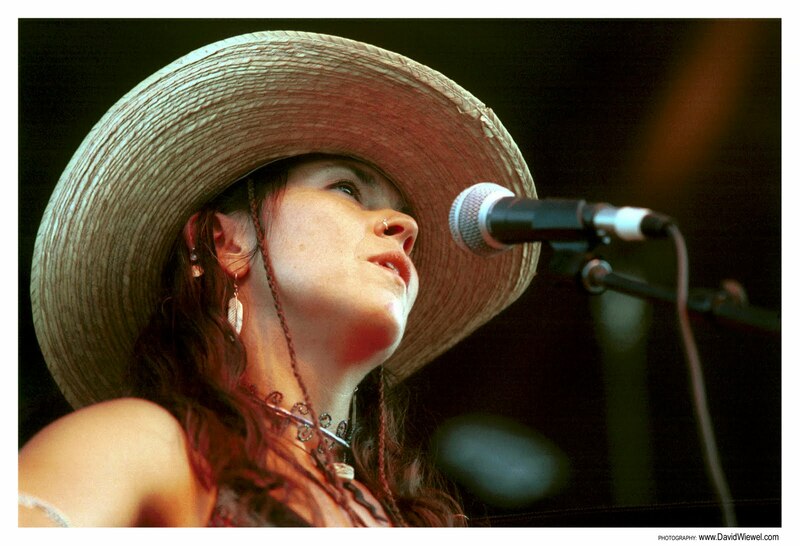 It has been 10 years since Darlene last appeared at Summerfolk and a return visit is long overdue. With songs that are whimsical and adventurous, and while most often accompanied by guitar, she is apt to play a tune on a child's toy accordion and on the next, accompany herself with a didgeridoo. Always exploring new territory, Darlene has lived the life of a troubadour since 1990. Seeking inspiration from the minstrel road, she has a different sense of folk roots seasoned with styles ranging from blues, jazz, gipsy, First Nations, Mexican and American folk music. Truly unique, she is a modern day musical gypsy. De Temps Antan, composed of Éric Beaudry, André Brunet and Pierre-Luc Dupuis, perform time-honoured melodies from the stomping grounds of Quebec’s musical past. Using instruments like fiddle, accordion, harmonica, guitar and bouzouki, these three virtuosos blend boundless energy with the unmistakable joie de vivre found only in traditional Quebec music. You can catch De Temps Antan at the dance tent, in workshops and at Sunday night's amphitheatre concert. Performing the hauntingly beautiful music of the Andes, Eco Andino is a Montreal-based sextet that presents the musical wealth of South America on Canadian soil. Formed in 1993, the group incorporates traditional flutes (quena, quenacho and tarkas), panpipes (sikus), stringed instruments (charango, ronroco and hualaycho) and many percussion instruments unique to Peruvian and Bolivian culture. New Hampshire's Nils Fredland is one of the busiest and most sought-after dance callers in the business. He has been making music, leading dances and bringing people together for 20 years as a teacher, singer, instrumentalist and community dance caller. He will be bringing his technical skills, friendliness and soothing voice to Summerfolk's dance tent. So get ready to kick up your heels with one of North America's top contra dance callers. Though Grit Laskin is world-famous for the guitars he builds, he has also spent 25 years writing and performing music. He plays tenor mandolin, Northumbrian smallpipes, concertina, guitar and fiddle, and he has accompanied musicians as diverse as Raffi and Stan Rogers. Respected as a songwriter as well as a musician, Grit’s songs have been recorded by the likes of Pete Seeger and the Tannahil Weavers. Our enthusiastic Summerfolk Choir director, Tom Leighton is a man who loves music. He has a great appreciation for every musician who plays and every singer who sings. His work can be heard on countless recordings and he's played with many notable performers including a long association with pal Mark Haines. A strong supporter and contributor to the folk scene in Canada, Tom makes The Summerfolk Choir a wonderful experience. Danny Michel is another artist who need no introduction. This uniquely gifted guitarist and songwriter is universally lauded for his lyrics. He has released six solo albums, a DVD and an entire CD devoted to covers of David Bowie songs. His creative live shows leave audiences raving about his talents. The electrifying group Poor Angus returns this year after an impressive debut at Summerfolk in 2009. Performing both traditional and original music, Poor Angus encompasses Scottish, Irish and East Coast sounds in their fiery arrangements. Highland pipes and Irish whistles are accompanied by fiddle, guitar, mandolin, bodhran and bass guitar. Add to that, their full-voiced four part vocal harmony makes Poor Angus one of Canada's strongest acoustic bands. Traditional songs and tunes give Ian Robb an important place in Canadian folk music. 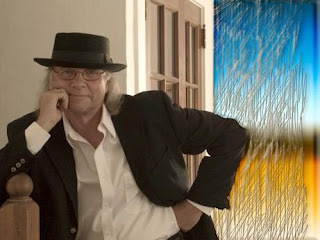 Since arriving from his native England in 1970, Ian has performed at festivals, concerts and clubs across the continent. Recipient of a Canadian Folk Music Award for best Traditional Singer in 2005, his extensive repertoire of songs and concertina instrumentals is unsurpassed. A Summerfolk favourite, Mose Scarlett's golden rich baritone voice and intricate finger-picking guitar style takes us on a sentimental journey through the 'good old tunes'. With his entertaining blend of blues, jazz, ragtime and Tin Pan Alley treasures, Mose never fails to entertain. Grizzled yet verging on elegance, deadpan yet bordering on hilarity, he is truly one of a kind. Sheesham & Lotus created quite a stir the last time they came to the Festival. Performing a genre few others tackle, their old-time tunes and performance style harkens back to another time. They flatfoot buck-dance and hambone hand-jive; they perform harmonica duets, minstrel show and crooked fiddle tunes, and they play instruments like the jaw-harp, fiddle, fretless and gourd banjos, spoons and bones. I was so impressed by the songs of Rob Szabo and the way he presented himself when I saw him perform, that I knew he would be a perfect fit for Summerfolk. His songs have twists and points of interest that make you pay attention and Rob's ever-present wry smile makes you feel like you’re in on a shared secret. Len Wallace is a folksinger and musician in the truest sense. He is a virtuoso accordionist who breathes life into his instrument and a passionate vocalist with songs that tell the tales of ordinary folk - their extraordinary lives, histories, struggles, hopes and dreams. His is music that stirs the soul, performed with integrity and conviction. Michigan's Matt Watroba is perhaps best known as the producer and host of 'Sing Out! Radio Magazine' for XM/Sirius satellite radio. However Matt has long been a folk music aficionado building his repertoire of songs for over 25 years. With a friendly and engaging style, his voice reaches right into the heart. His goal: 'always leave the audience feeling better than they did when they came'. So that's pretty much everyone scheduled to perform. If you're keeping track, there are 54 acts in total, soloists and groups, coming to Kelso Beach Park to play Summerfolk. I can't wait - our 35th anniversary is going to have some fabulous music! In last week's blog I highlighted four acts with connections to Owen Sound and area. This week I continue on that theme. There are a number of people I count on to bring their enthusiasm and expertise to the Festival. For example, The Voice of Summerfolk, Dave Carr is back for his 26th year as Summerfolk's MC. Dave is of course, a well-known Owen Sound broadcaster. Along with hosting our evening amphitheatre concerts, Dave works on The Summerfolk Quiz and emcees the amazing Mixed Up Bands workshop on Sunday. Bognor's Bob Dixon is another valued contributor. As is the tradition at Summerfolk, his bagpipes signal the start of the nightly amphitheatre concerts and are featured in Sunday night's Finale. The popular JumbleJam songwriting sessions are facilitated by Owen Sounders Ken Dow and Martin Cooper. They curate fifteen volunteer players into three bands, each anchored by a Summerfolk performer. These bands create an original song during a writing session in the afternoon and then perform it on the Down by the Bay stage on Saturday evening. It is, when you think about it, quite an incredible feat and always sparked with large doses of creativity. Taking the excitement of 'building a song from scratch' to the Children's Village, Ken and Martin are also offering a JumbleJam workshop for children on Sunday. Vita Bowen first attended Summerfolk with her parents, pottery experts Vince Bowen and Kate McLaren, and has been a long-time attendee. Now as Vita Twirlin' Diva, she heads up the fire poi demonstration in the Summerfolk Circle on Saturday night. This is really quite a thing to see as flames at the end of chains are spun around the body in an expressive way to create beautiful patterns and visual effects. Vita also leads impromptu hula hooping sessions for children and adults, animating the site in a unique way. Featuring some of the most creative and talented up-and-coming performers from Owen Sound and area, First Rate People includes core members Jon Lawless, Liam Sanagan, Alicia Ross and Hayden Stewart. The idea for First Rate People was spawned in 2007. 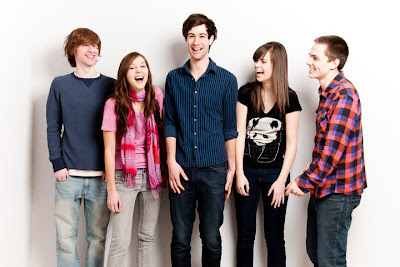 Just out of high school, this group of young musicians started creating folk-pop music and evolved into more of a collective than a band. In fact, their first recording included some 60 people. First Rate People loves to experiment as songwriters and musicians who believe in the art of collaborating. They are a band that knows no boundaries. The online momentum and buzz about FRP is spreading rapidly. This is a group that is adapting to new mediums to promote itself but has its' roots firmly planted in the Summerfolk tree. Samantha Martin and the Haggard is a Toronto-based roots/rock foursome who add blues and country sounds into their musical mix. Samantha Martin began her musical career in Lion's Head on the Bruce Peninsula. In her teens she sang country, blues, bluegrass and 60's folk/rock songs, quickly becoming a crowd favourite with her exceptional voice. Now in her 20's, she manages The Dakota Tavern in Toronto and pursues her musical career with The Haggard. Those lucky enough to hear Martin sing are left wondering how all that soulful power comes out of a five-foot frame. She recorded her debut album Back Home in 2008 with a group of session musicians. Material from that album remains a staple of her live show with The Haggard, but they really shine on material they have since worked up together. All three members of The Haggard bring with them a wealth of musical knowledge and also perform with the country group, The Kensington Hillbillies. Samantha says of drummer Pete Lambert, guitarist Mikey McCallum and bass player Greg Sweetland, "We draw out the best parts of each other, we bring out the best in each other musically. We`re friends and becoming a really tight unit." Randy Morrison & the Flatt River Band is a newly formed group but they are not newcomers to bluegrass music in Ontario. The band is made up of experienced players centered around Randy Morrison, an award-winning fiddle/mandolin player who first came on the scene with the band Bruce County Grass in the 1980s. Randy is from Teeswater and traces his fiddle roots to his father Lincoln Morrison who was a well-known fiddler in Huron County. Around the time the Bruce County Grass group broke up, Randy was in many ways, mentored by Graham Townsend. Graham was without question, one of Canada's most versatile and smoothest fiddlers. In subsequent years, Randy has played with many groups including a stint with Charlie Pride. Lead singing for The Flatt River Band is handled by guitarist Richard Dugal, formerly of the fine band Clean Sweep. Banjo player Larry Millar rounds out the band along with Martin Chapman on standup bass. Oddville Stage Company is an umbrella for many exciting projects, including the Oddville Music Show, developed by Steven Morel and Jenny Parsons, award-winning Second City alumni. Jenny and Steve recently moved to West Grey, in the vicinity of Allan Park between Hanover and Durham. 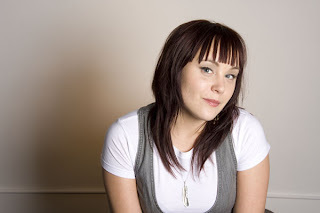 Jenny co-wrote and performed in six original revues for Second City, two of which received Toronto's theatre award, The Dora, for best new musical review. She performed in Martin Short's live show which toured North America and her film credits include appearances in Hairspray, Cheaper by the Dozen Two and Pushing Tin. Steve performed, produced and directed with Second City for almost 20 years and has worked with the likes of Martin Short, Eugene Levy, Colin Mochrie and Ron James. They have created a neo-vaudevillian road-show called A Swell Chaos which toured Northern England earlier this year and a 'silent' musical feature film The Oddville Picture Show, for which they sang and played all of the instruments as accompaniment. They can also be seen on TV co-starring in the Family Channel’s new show Wingin’ It. Together they perform original and old-timey sing-a-longs on banjo ukulele and washboard as the musical comedy duo - The Oddville Music Show. 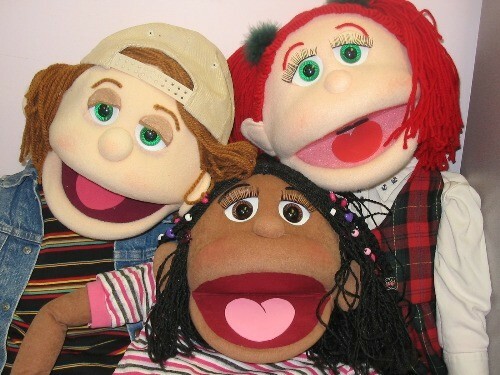 With appearances throughout the Festival weekend, they will be featured in Sunday night's The Last Laugh at Summerfolk. Along with PEI's Chuck and Albert, Rob McLean and Terry V. Hart make up the comedic third act for The Last Laugh. Rob works regularly with Larry Jensen but he is also part of the Canadian comedy scene as musical director for the Canadian Comedy Awards and a recipient of several awards himself. His pal Terry V. Hart is a master of improvisation and alumni of the famed Second City, having spent over twenty years delighting audiences across Canada and the U.S. The Jocelyn Pettit Band performs a high-energy fusion of original, old and new music led by fiddler Jocelyn Pettit and her youthful enthusiasm. She is just 15 years of age. With outstanding talent, unwavering determination and an excitement to explore new ideas, Jocelyn has quickly developed impressive musicianship well beyond her years. Jocelyn resides in Squamish, British Columbia with her parents Siew Wan Khoo and Joel Pettit who also play in the band. She has attended Summerfolk on many occasions as the family makes yearly trips to visit relatives in Owen Sound during August. At last year's Festival, her fine performance on Summerfolk's Open Stage earned her a spot in our 35th anniversary lineup. First inspired by the fiddle music of Cape Breton, Jocelyn enjoys creating her own compositions and crafting arrangements of Canadian, Scottish and Irish tunes, both traditional and contemporary. Two fine folks who help to make Summerfolk a special place are John Somosi and Kathryn Edgecombe. They reside in Bentinck Township just outside of Hanover. I 'inherited' John and Kathryn from previous artistic director Liz Harvey Foulds who brought them to Summerfolk to create the First Nations Village; and what a fine addition they've been. They set up the centerpiece teepee and present cultural workshops based on Aboriginal traditions. So that's a look at the Summerfolk performers with connections to the area. Celebrating the culture and talent of the region gives each of us a sense of place. They speak to us directly, and in many ways, they speak for us. Summerfolk has long been a showcase for the world-class talent that lives right next door. In this week's blog, I would like to start highlighting the Summerfolk performers who have a connection to Owen Sound and area. A dance music collective, world-class songwriter, puppetry group and the heart-warming story of Tom Parker's new band will be all I can fit in this piece. So as they say, 'to be continued' next time because there are many more to talk about. Members of the Kelso Céilí Collective have in common, a great joy in the jigs, reels, hornpipes, polkas and slides of Irish social dance and session music. These Owen Sound and area musicians have played this repertoire at traditional music sessions around the Grey-Bruce region for many years. Some have also been members of contra dance bands including the Glenelg Full Moon Country Dance Band, Jump Start and Scatter the Cats. For Summerfolk this year, and for the first time together, these players will focus on their shared enthusiasm for the traditional Irish céilí dance repertoire. The Collective will offer their lively tunes and rhythms for social set and céilí dancing at the Summerfolk Dance area, with dance callers Wilfred Gaube and Elisa MacDonald guiding the dancers' steps. The group will also perform for diners and listeners at the Summerfolk Café of The Senses Friday evening at 5 pm, and you’ll see them throughout the weekend at whatever informal sessions they can stir up. The Kelso Céilí Collective relies on, but, as with any collective, is not limited to the participation of Will and Lynda Henry - fiddle and concertina, Maureen Keating - piano and piano accordion, Bob Robins - guitars, banjo and mandolin, Scott Henderson - flute, whistles and border pipes, Dan McGee - flute, Frank Francalanza - mandolin, tenor banjo and percussion, Ned Vereecke - flute, whistles and bodhran. One of the most loved and admired songwriters in the Owen Sound region, Larry Jensen has been writing, recording and performing his songs for four decades. In 2009, he was awarded the Owen Sound Cultural Award, given in recognition of his outstanding musical contribution to his home community. He has released 14 albums of original songs and a recent tribute CD, Demons & Saints, features 19 cover versions of Jensen songs with some 50 musicians contributing to the project. 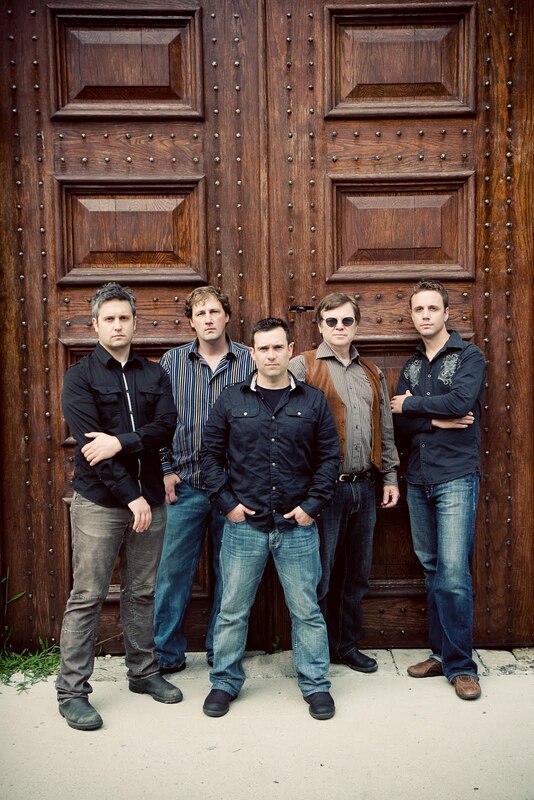 Jensen appears in concert with his band on Friday night in Summerfolk's Down by the Bay tent. The band includes some of Owen Sound's finest musicians - bassist Tyler Wagler, guitarist Joel Morelli, drummer Dave Farrar and Rob McLean on keyboards. This year will mark Larry's 19th appearance at Summerfolk. Designed to increase awareness of mental health issues for children, The Grey Bruce Friends and Neighbours Club uses child-sized puppets to engage children in lively and thought provoking shows they can relate to. Jackie Ralph and her FAN Club team will be featured performers in Summerfolk's Children's Village, presenting shows on Saturday and Sunday during the day. There will be plenty of interaction and fun, with good messages that children find useful. Kids are encouraged to talk, listen and learn; then find solutions to issues. Offered through the Grey Bruce branch of the Canadian Mental Health Association since 2003, the Friends and Neighbours Club has made presentations to thousands of children in schools and at special events. So named after a line in the Roger Miller song My Uncle Used to Love Me But She Died, Lickin’ Good Fried takes up that wacky bard's mission to balance tragedy and comedy in a 3 minute or less country song. Lickin' Good Fried is fronted by Tom Parker who's grandfather Harry Parker was one of Owen Sound's best known fiddlers. Tom has appeared previously at Summerfolk with his band, The Backstabbers Country Stringband, in 2000 and 2001. 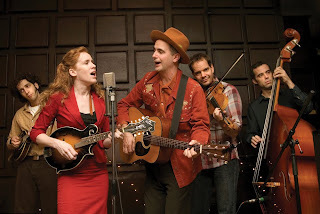 Lickin' Good Fried includes Tom's wife, jazz singer Alex Pangman. Nicknamed 'Canada’s sweetheart of swing', Pangman has been singing vintage songs since her early teens when she discovered the music of ’20s and ’30s. She released four CDs with her band, The Alleycats, including two produced by the late guitar great Jeff Healey, and she went on to win national awards for her work. Tom and Alex put everything 'on hold' in 2008. Pangman had been born with cystic fibrosis and her lungs were failing. It was becoming increasingly difficult for her to sing. “Getting out of bed was a struggle" she recalled. "As soon as I sat up, I would cough for half an hour, and getting showered and dressed left me winded.” The 33-year-old singer underwent a life-saving double lung transplant at the Toronto General Hospital that fall. Pangman and Parker marked the one year anniversary of her operation by releasing Say Uncle!, which was recorded with their bandmates in Lickin’ Good Fried and produced in the couple’s home a few months before Pangman’s operation. Coming through such tragedy, the rollicking old-time country music of Lickin' Good Fried offers the couple the opportunity to enjoy making music again. Lickin' Good Fried also includes veteran stand-up bassist Sam Petite along with John Showman and Andrew Collins who, in my opinion, are two of Canada's most talented instrumentalists on fiddle and mandolin respectively. John Showman's recent album release entitled Showman, is one of the finest recordings of fiddle music I have heard. Both John and Andrew also perform with the well-known bluegrass band Foggy Hogtown Boys and the innovative Creaking Tree String Quartet. 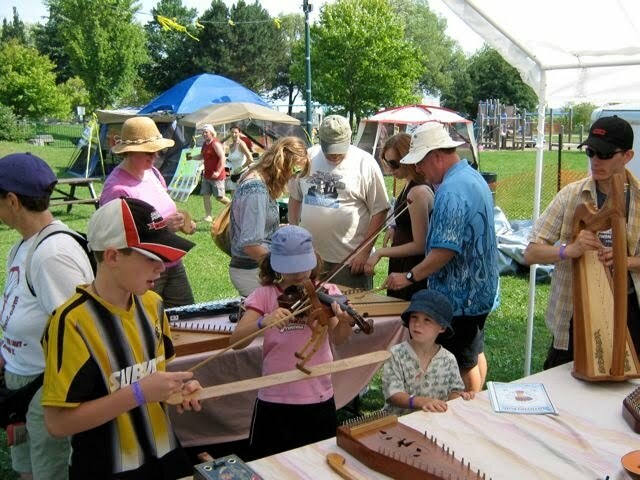 One of the most talked about 'exhibits' at last year's Summerfolk was Todd Crowley's Musical Petting Zoo. 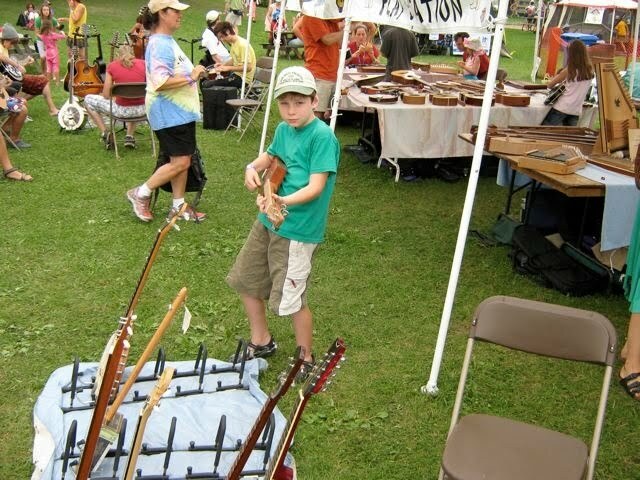 Festival patrons were really enamored with Todd's collection of musical instruments. In and around a tent, more than 100 were on display, set up on tables and on tarps. Representing the musical alphabet from accordion to zither, the Musical Petting Zoo is a fully interactive and hands-on activity. Not only can you examine how the instruments are made, but you are encouraged to play them. When it came time to determine which performers should be invited to our 35th anniversary Festival, there was no question - Todd Crowley and the Musical Petting Zoo had to return. At the Zoo, there are stringed instruments like the kantele, qanun, bouzouki, charango, dulcimer and harp; odd musical gizmos like saws and zouks; percussion instruments like the udu, djembes and other drums; flutes of all description; the didgeridoo and yidaki ...plus oodles of more familiar instruments like guitars, banjos, fiddles and autoharps. 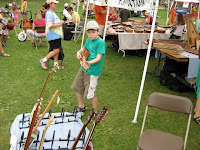 Participants of all ages are welcomed to pick up an instrument, often for the first time, and 'pet' it. Some instruments are strummed or plucked, others bowed or plucked. Some you beat or strike, some you blow into. It is about the magic of discovery that a crafted work of wood and strings can make beautiful harmony or disharmony, and that a drum from West Africa can sound much like a Native American drum. This spirit of discovery is the inspiration of the Zoo keeper - Todd Crowley is a patient, caring man with a true love for folk music. "My belief about folk music is that it isn’t just music to listen to from a seat in the audience. Folk music is about making music of our own, on all levels, and then passing it on to the next generation." "The instruments have a common DNA" says Todd, "just like all human beings, from a primitive mouth bow to a Celtic harp, from a Puerto Rican Cuatro to an African Kora. 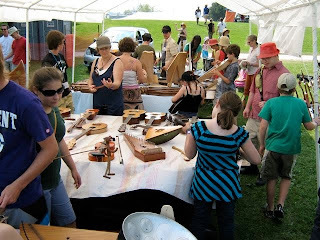 The Musical Petting Zoo, with a choice of instruments from around the world, is a vivid and tangible display that we are all interconnected." "Often I have found the Musical Petting Zoo attracts the artists as often as it attracts novices and children. At the Folk Alliance in Memphis recently I watched an accomplished professional steel guitar/harmonica/accordion player 'toy' with an Anglo concertina for over an hour. He became a child again rediscovering the joy of making sounds on an instrument totally unfamiliar to him. By the time he walked away playing Mary Had a Little Lamb you might have thought he’d have just won a Grammy." Todd was first attracted to folk music as a youngster, listening and singing along to his sister's LP records of people like The Chad Mitchell Trio, Joan Baez and Bob Dylan. "Early on, I also connected with the politics of folk music and the way it often brings dignity to the stories of the poor and dispossessed. Whether a Civil Rights Era Phil Ochs song or an old Irish ballad about resisting English oppression, folk songs tell a history not often found in the history books. As a folk singer I want to be part of the oral tradition that gives voice to the sacrifices men and women have made to promote peace and justice." In 1981, Todd lived with the legendary autoharp performer Bryan Bowers. Todd was then the assistant coach for Bryan's son's varsity basketball team. At the end of their year together, Bryan gave Todd his first autoharp lesson and presented him with his first single key G 'harp. In the years since, Todd has collected over 50 autoharps. "I have found the diatonic autoharp to be the perfect accompanying instrument for the songs I sing" says Todd. "The autoharp lets me keep the instrumental part of the song simple, so the words in story and poetry can take center stage." "I am not a rocker or bluesman or singer-songwriter. I sing and play folk songs, old and new" Todd says of his musical career. He believes a folk instrument is part of the folk tradition, where the sharing of one’s love and knowledge of the music, song and stories of the past help to keep the traditions alive. The instruments in the Zoo tell a story of their own, each time a child connects to the folk tradition by trying an instrument for the first time, or an adult rediscovers the joy of making music. Todd has just opened a year-round home for his collection of instruments. Todd’s Musical Petting Zoo and Folk Life Center in North East, Pennsylvania is open during the school year for free field trips, after school drop-ins, lessons, evening jams, concerts, open mics, etc. He is hoping it becomes not just a regional attraction, but a nationally recognized folk music center. However, for the upcoming summer season, Todd is taking the Musical Petting Zoo on the road to festivals across North America - Mariposa, Champlain Valley, Hartford, Ottawa, Delaware, Flagstaff and of course, a stop at Summerfolk August 20, 21 and 22. The album was recorded in an east end Toronto studio and on Wolfe Island, near Kingston. As the songs for the album came together, a strong lyrical theme emerged involving embers, flames and ashes. "That's why I called the album oh little fire" explained Harmer, "because of the idea of keeping something burning and tending to a fire." "I heat my home with wood and you can have the best materials, the driest wood, but put too big a log on it and you can bury it, and you don't give it enough air, it does not burn. I just found that was really metaphorical for relationships. You just have to gingerly care for them and tend to them." 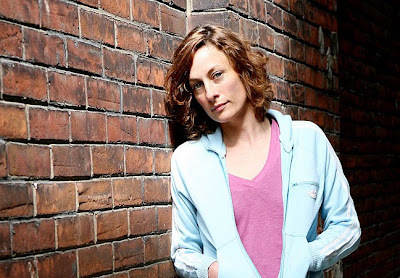 Clearly a flame is burning in Sarah Harmer, fanning her creative process. oh little fire is 'rockier' than her previous efforts but her forte of crafting brilliant songs is still obviously showcased. The album sounds like she has been reinvigorated and positively charged. Blessed with one of the most natural and distinctive voices in Canadian music, this multi-talented, down-to-earth singer/songwriter sets her lyrics over roots, pop and folk rhythms. She writes catchy songs that you enjoy hearing again and again. In an industry that pumps out songs like candy from a machine, Harmer is a breath of fresh air. She is not afraid to take her time getting it right - with a confidence to experiment and let her music grow. The youngest of six children born to farmer Clem Harmer and his school teacher wife Isabelle, Sarah grew up on a hundred-acre farm near Hamilton. It was a musical family - her brother passed down classic ‘70s albums, her sister Nancy took her to see Springsteen when she was 14 and her sisters Mary and Barb snuck the 16-year-old Sarah into clubs to see their friends in a brand new band called the Tragically Hip. "We’d go to Brampton, Kincardine, Wasaga Beach, when they were playing these little bars to nobody," enthused Harmer, lighting up like the wide-eyed teenager she was in 1986. "I vividly remember going into the graffitied band room and being really shy after watching these guys on stage. I was forever changed after that. 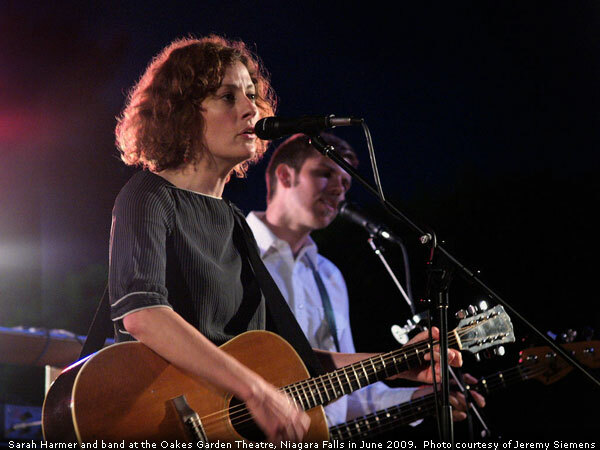 "Tragically Hip front-man Gord Downie remembers the teenaged Sarah Harmer quite well. "I met Mary Harmer in my first year at Queen’s and we were inseparable. I went out to the Harmer homestead on occasion. You figure out very quickly that all the Harmers are big-hearted and fun lovin’ people, every one of them, and you want to be around that a lot. They all sang for its own sake, and still do." At the age of 17, she was invited to join a Toronto band, The Saddletramps. For three years, she juggled playing in the band with her studies in philosophy and women's studies at Queen's University in Kingston. After leaving The Saddletramps, Harmer put together a band of her own called Weeping Tile. The band released its first independent cassette in 1994. They signed to a major label, the cassette was re-released as an EP and they quickly became a popular draw on the rock club circuit and on campus radio with their subsequent albums. Around this time, Sarah moved into the farmhouse at the edge of Kingston where she still currently resides. On sabbatical from Weeping Tile, Sarah recorded Songs For Clem, a collection of country and jazz favourites to give to her father as a Christmas gift. Harmer’s voice was a natural fit for such songs like 'Stormy Weather', 'Black Coffee' and 'Sentimental Journey'. It was never intended for release, but at the insistence of her friends, she made it available to the public. Songs for Clem soon earned high-praise from a bevy of critics throughout Canada, and inspired Billboard's Larry LeBlanc to describe it as "the most intimate, personalized and tasteful roots-styled album I've heard in years." This kick-started her solo career and Harmer quickly began working on another album. In 2000 she released You Were Here, a 'poppier', more laid-back effort than her work with Weeping Tile. You Were Here became Harmer's mainstream breakthrough, spawning the hits 'Basement Apartment' and 'Don't Get Your Back Up'. The album also appeared on many critics' year-end lists, including TIME magazine, which called it the year's best debut album. It was eventually certified platinum for sales of 100,000 copies in Canada. Almost half of the album, including both of its major hits, consisted of songs she had previously recorded with Weeping Tile or The Saddletramps. In 2004, she released All of Our Names which included the singles 'Almost' and 'Pendulums'. Her fourth album, I'm a Mountain, was released the following year. It was nominated for the Polaris Music Prize, a jury-selected $20,000 cash prize for the Canadian Album of the Year. This folk and bluegrass flavoured CD was also was nominated for a Juno Award - Best Adult Alternative Album, and Sarah was nominated in the Songwriter of the Year category. In a third nomination, Escarpment Blues was up for Best Music DVD. 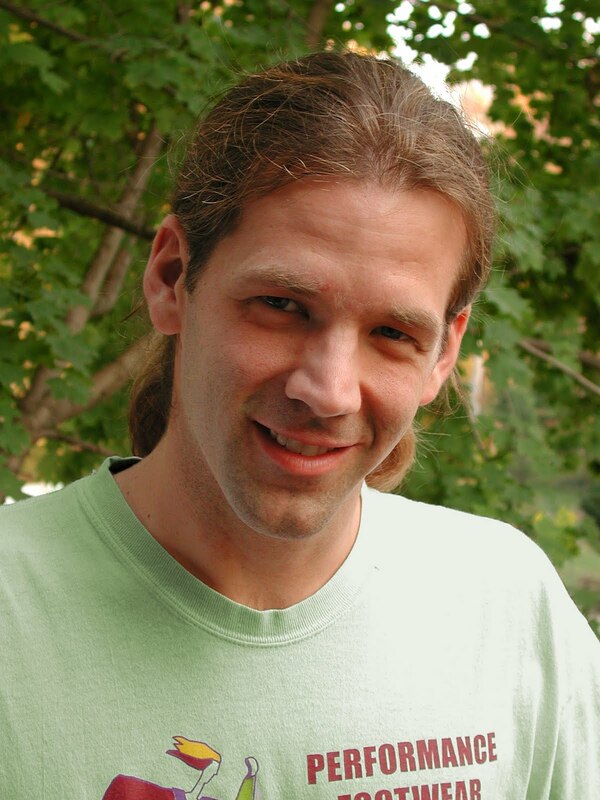 Harmer co-founded PERL (Protecting Escarpment Rural Land), an organization which campaigned to protect the Niagara Escarpment from a proposed gravel development on the Mount Nemo Plateau. To support the organization, she and her acoustic band embarked on a tour of the escarpment, hiking the Bruce Trail and performing at theatres and community halls in towns along the way - including a couple in this neck of the woods. The Escarpment Blues DVD that documented the trip is still available. "This was a very grass-roots tour," Harmer said of the adventure. "We used biodiesel in our van, to be easier on the air, and started at Tobermory at the tip of the Bruce Peninsula. We just kept heading south. We played eight shows and received an excellent reception. They were such intimate venues and we met people all along the escarpment. The final concert was on Lake Ontario at the Royal Botanical Gardens in Burlington - it seemed like the perfect place to end the tour." Harmer is a prolific poet who performs an infectious country/folk blend that owes much to her imagery, and an environmental activist who uses her music to purpose. Her voice is one of the most affecting in contemporary music. With hooky melodies and insightful lyrics, she has attracted many fans to her music. With a history of a successful recording and touring career, it will be a treat to hear Sarah Harmer Saturday night at Summerfolk. 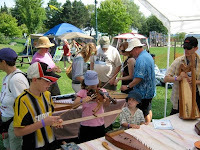 ©Georgian Bay Folk Society. Watermark theme. Powered by Blogger.